by Sherfield, Robert M.; Moody, Patricia G.
Dr. Robert M. Sherfield is currently a Professor in the School of Arts and Letters at The College of Southern Nevada in Las Vegas, Nevada. He is a nationally recognized educator, writer, and speaker having spent the past 27 years working with faculty development, first year student success programs, student motivation, and retention. An award-winning educator, Robb was named Educator of the Year at the College of Southern Nevada. He twice received the Distinguished Teacher of the Year Award from The University of South Carolina at Union and has received numerous other awards and nominations for classroom instruction and advisement. Robb has also been guest speaker and delivered keynote addresses to over 400 institutions of higher education across American in 46 states. He has spoken to The Pennsylvania, Texas, California, Florida, Indiana, Minnesota, Washington, Oklahoma, Ohio, New Jersey, Colorado, Virginia, Tennessee, Louisiana, and Arizona Private/Career College Associations. Dr. Patricia G. Moody is Dean Emerita of the College of Hospitality, Retail, and Sport Management at the University of South Carolina, where she has served on the faculty and in administration for over 30 years. An award-winning educator, Pat was honored as Distinguished Educator of the Year at her college and as Collegiate Teacher of the Year by the National Business Education Association. She was also a top-five finalist for the Amoco Teaching Award at the University of South Carolina. She received the prestigious John Robert Gregg Award, the highest honor in her field of over 100,000 educators. 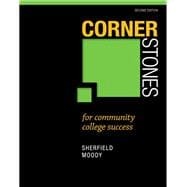 Prior to writing in the Student Success field, Pat published several business books and simluations. A nationally known motivational speaker, consultant, and author, Pat has spoken in most states, has been invited to speak in several foreign countries, and frequently keynotes national and regional conventions. She has presented her signature, motivational keynote address, “Fly Like an Eagle” to tens of thousands of people, from Olympic athletes to corporate executives to high school students.